So you’ve been through the Virtual Gastric Band program and you’ve lost weight over the four sessions you had. We expect most people to lose 8 lbs over the four weeks and we like to see a steady loss that can be sustained over the months ahead until you reach your right size. Now some people lose that much weight in the first week and others after four weeks have shed 16-20 lbs. But typically 8 lbs is a good expectation to set and puts you on the path to 50 lbs weight loss in six months. Most people are happy with that figure as it represents quite a few dress sizes or trouser waist sizes less than in their current wardrobe. But getting from 8 lbs to 50 lbs loss is not a given. It requires sticking to the plan – or golden rules as we call them. 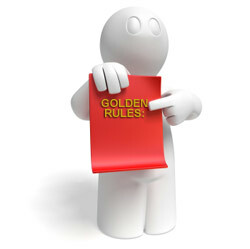 During the 4 sessions of the Virtual Gastric Band procedure you’re required to follow the 8 golden rules of the program. You’re provided this prior to the first session and basically, they’re not for everybody. And we are quite blunt about the rules – follow them and you will lose weight – don’t follow them and you won’t lose weight. For some clients I’ve asked them to leave the program as we are wasting each other’s time and money. But we’ve found those who follow the rules succeed in controlling their portions and losing weight. Once the hypnosis and Virtual Gastric Band sessions are over it is easy to do what most people on a weight loss program do after a period – slip back into old habits and the program goes out the window. You made a promise to yourself you were ready for a change and this time it would be different. And this is where your commitment comes into play. You’ll receive as part of the VGB program a hypnosis session on CD to listen to twice each day during the four weeks of the session. Now continue to listen to the CD for reinforcement. After a few weeks listening once a day is enough – but listen to it everyday for the next six months or until you feel you don’t need the reinforcement anymore. By the same token live by the 8 golden rules – no exceptions. After 30-day they should be habit anyway and you’ll not need to do self-monitoring, but others need the extra vigilance for awhile longer. Remember the key is smaller portions and eat only until you’re satisfied and not full – every meal. But follow all the golden rules. They’re your mantra. Listen to the CD and follow the golden rules and you WILL achieve your weight loss goals and be the right size for you. If you’re reading this post and wondering what this is all about but ready to make drastic changes to get to your right size then book your Virtual Gastric Band procedure in the Metro-West Boston area by contacting Erika Slater at 508.529.2490 508.269-0109.